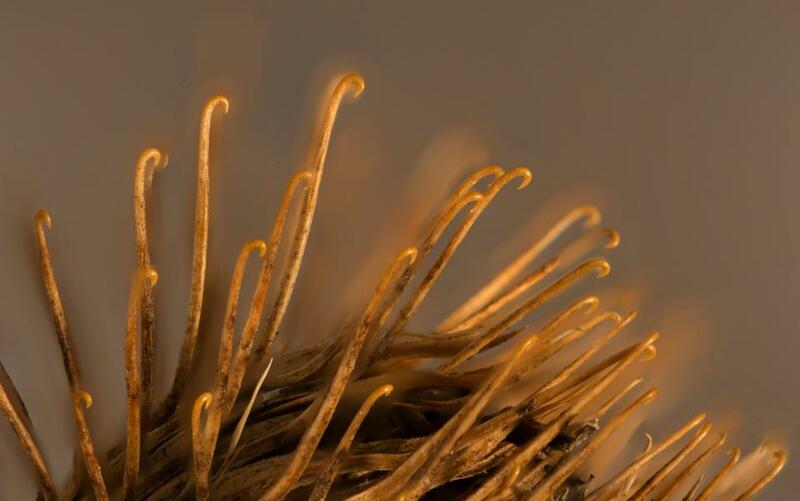 One day in 1941, a Swiss scientist was walking his dog, and noticed with annoyance, like so many other dog-walkers before and since, that his pet had blundered into the tall prickly plant called burdock. And as he was picking the infernal little hooked seeds out of the dog’s fur, he had a bright idea. What if this idea–sharp curved hooks binding two things–was used by people? It took him years to get anyone to take the idea seriously, and even longer to develop a model that would work–not surprisingly, since he made his first attempts out of cotton. But finally he tried synthetic fabrics, like nylon, and the rest is history. The guy patented the idea and made a fortune. Velcro was a simple, inexpensive way to bind two objects reversibly–the zipperless zipper. It’s used today by NASA, the US military, preschoolers who haven’t yet learned to tie their shoes, and anyone who goes camping or has pockets. 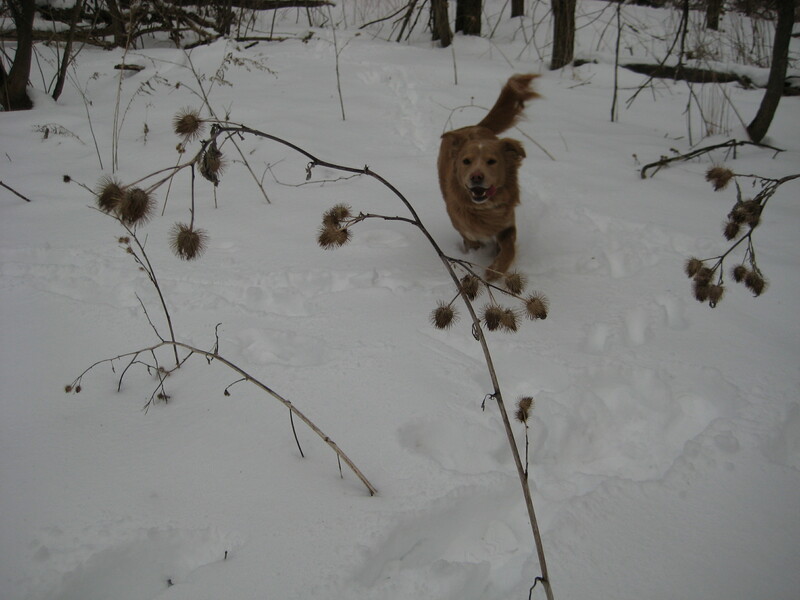 The really interesting part of the story is that it should have taken humans so long to figure out what dogs have always known–that nothing adheres to fuzzy surfaces more effectively than the tiny curved hooks of burdock. When I wanted to take some photos of burdock, I didn’t have to look very hard. As any good botanist knows, it’s important to have a staff who can collect plants for you. 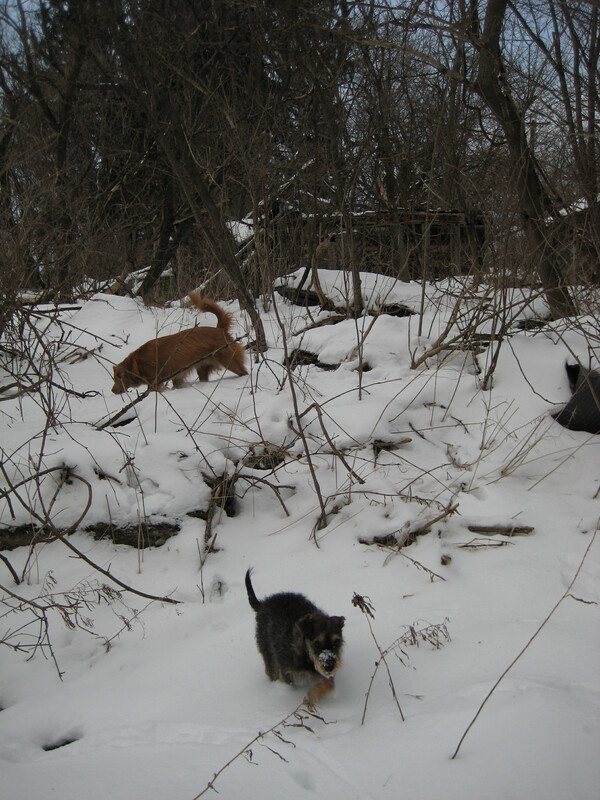 My staff went out on a snowy afternoon on a squirrel survey, and as expected came back in five minutes with my plant specimens. Inside those round barbed heads, of course, are seeds. 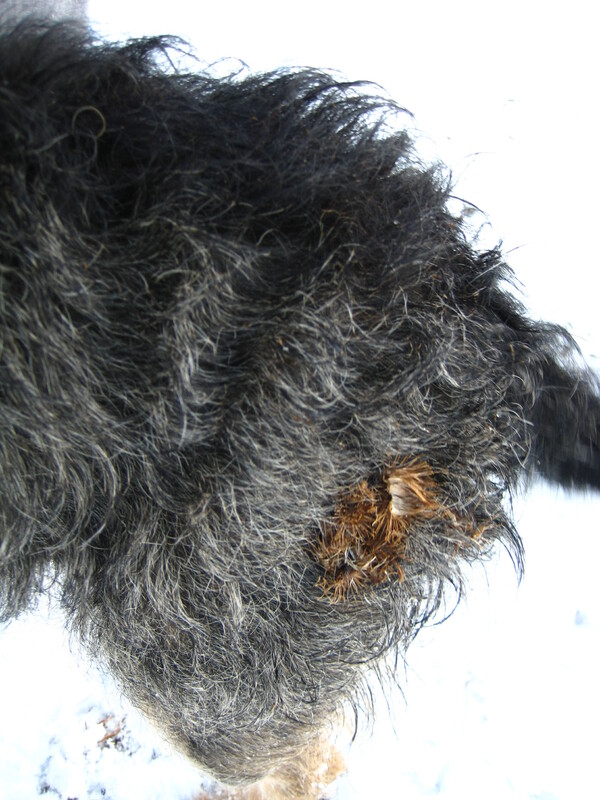 When the bur is torn apart by the animal scratching the irritating hooks, the seeds scatter far and wide. The plant was originally from northern Asia, but it’s easy to see how it spread around the globe, stuck in pant cuff or animal tail. And burdock isn’t just a weed. It’s a crop. It’s been widely cultivated as a food, especially in Japan. Sauteed or julienned burdock roots are apparently pretty good, though I haven’t tried them myself yet. 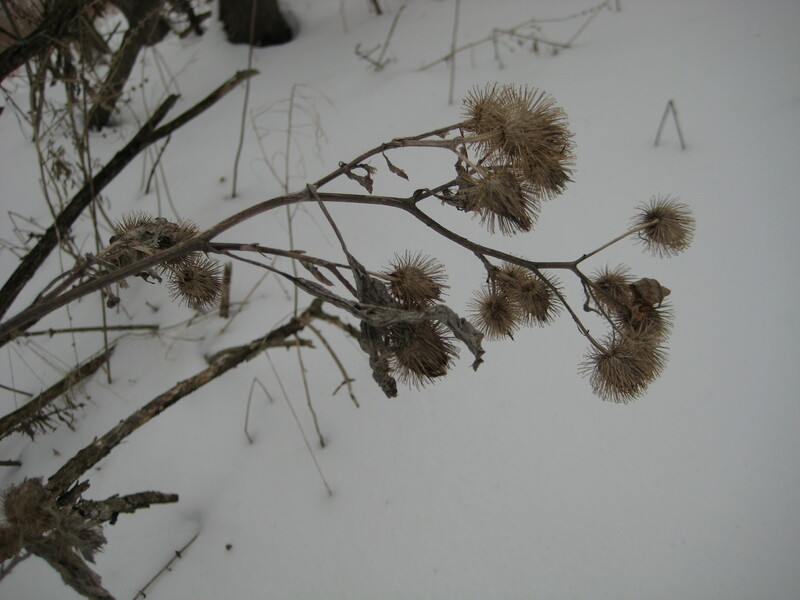 And burdock has many uses in herbal medicine, used for centuries to treat a wide range of ailments. It’s loaded with antioxidants, so it really is good for you. My tolerance for non-native weeds is almost limitless. Most of them, dandelions for example, are more of a cosmetic problem than a real threat to the environment. But burdocks are one of those alien plants that can do some real damage. Their juicy leaves and fragrant flowers are an invitation to small insects, and therefore creatures that eat insects flutter close to burdocks. And if a ruby-crowned kinglet gets too close to burdock’s murderous little hooks, the tiny bird can get trapped–lethally. Little brown bats can also get snared. The summer’s purple flowers even lure hummingbirds, with unpleasant consequences. 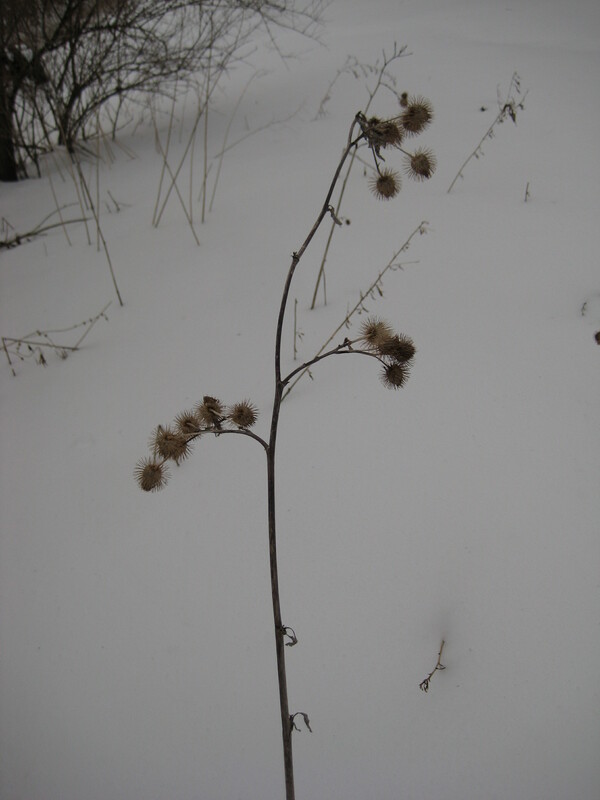 So burdock is one of the few plants I ruthlessly cut down when I see it growing tall in the back yard. In spite of my efforts, there’s plenty of it still out there, but I try to keep it in check. When the kids were little, it was the one plant they had permission to slay with their toy swords. It’s not a “bad” plant. It doesn’t destroy hummingbirds with evil intent. I even have a grudging admiration of a plant so superbly adapted But it’s a plant we need to keep an eye on, keeping it under control before it spreads to the point where people start talking about getting out the herbicide. Admire its ingenuity, and slay it with your sword. I like your suggestion to admire its ingenuity and slay it with your sword. Keeping certain plants under control is preferable to wiping out what we don’t like with herbicides. Interesting how the seeds get spread by animals that run against it and then scratch the hooks. Yes, it’s an amazing plant, isn’t it, but incredibly irritating. I got a bit in my eye once and it nearly drove me crazy! I can see why animals scratch it out. LOL – so that’s whats all over my the bottom of my sweater jacket! I definitely prefer velcro to burdock!